This summer, consider sending your young writer out of the city and into the hills for camp. Three upcoming SummerWrite workshops are being held at our second location, The Gell Center, located in Naples, NY. Each camp is slightly different, but at their cores are focused on writing and nature. Explore with professional writers and naturalists Angie Cannon-Crothers & Edgar Brown, along the Finger Lakes Trail, and observe the natural environment of the area. 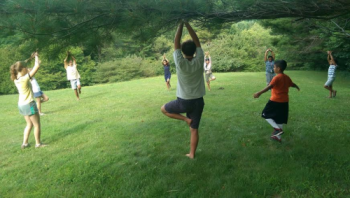 Campers will try a variety of natural arts activities, both ancient and modern. Create field journals to sketch and write stories, dramatic monologues, and poems probing the past, present, and future of the landscape, plants, and animals. By the end of the week, campers will have created an all-camp anthology. 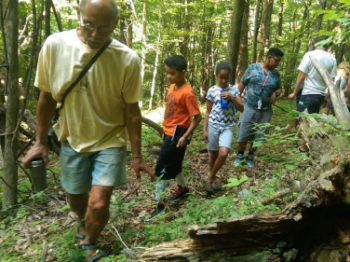 * The younger Where’s Walden group (ages 9 – 12) and the older Outdoor Writer (ages 13 – 16) group will function as separate classes, but some activities will overlap. Get more information about Where’s Walden here. Get more information about Outdoor Writer here. Based on the popular series by Suzanne Collins, campers will head to the Gell Capitol District for the Hunger Games camp! Each morning, tributes will learn hands-on skills in tracking, shelter building, fire building, wild edibles, and finding food. Their afternoons will be spent engaging in readings, discussion, and activities on social, ethical, and environmental issues facing our present and futuristic world. On Thursday contestants will begin their game, earning points based on learned skills and trying to snag valuable survival items while they work to protect their personal flag from capture! Under the careful watch of the Gamekeepers, the final event will last well into the evening out in the woods surrounding the Gell Center. Get more information about the Hunger Games here.